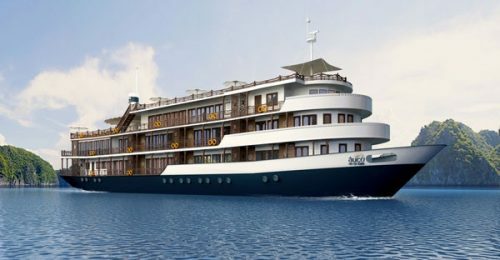 Inspired by traditional and classic beauty of old cruise on Halong Bay, Victory Star Cruise was designed by combination of traditional features with modern and luxury style. Victory Star Cruise is 58 meter long and 10.5 meter wide. Victory Cruise can serve 64 guests totally with 4 storeys, 2 bedroom areas, 01 living room for restaurant and bar and one sundeck for sunbath and relaxing. About 99 percentages of cabins have private balcony, each cabin has glass window view for you to enjoy the marvelous senses on Halong. 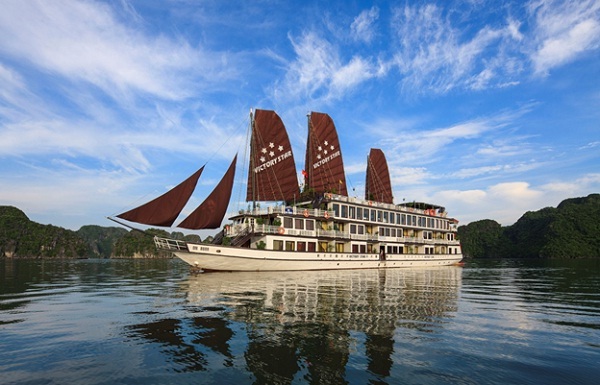 Victory Star Cruise still keeps classic style of traditional sailing boat on Halong. All significant cultural values have been described at furniture on Victory Star. 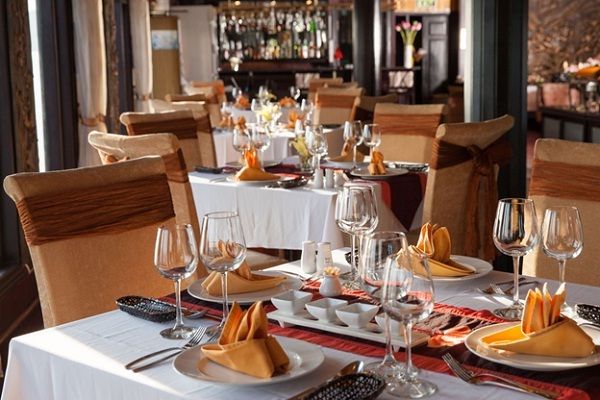 At the restaurant on Victory Star Cruise – Halong Travel both international dishes and Vietnamese food are available. Tourists can taste and enjoy delicious flavors from all over the world. Besides, at cooking class, tourists will see our chef create delicious Vietnamese dishes. 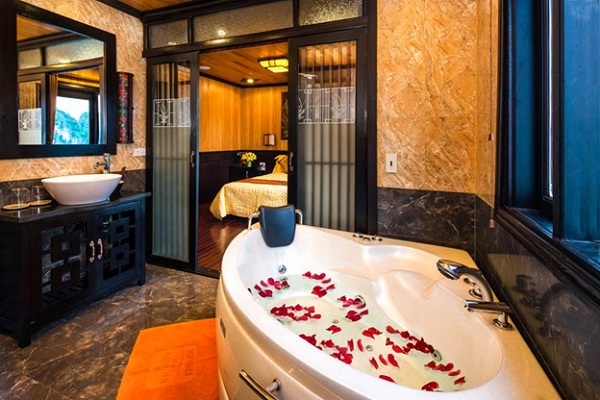 In addition, Terrace Suite will be your favorite place to enjoy breathtaking seascape of Halong Bay. This large and open-air space welcomes tourists to sit back and drink some cocktails. From there, you can have an ideal view to admire the sunrise in the early morning, the sunset in the evening as well as the sky at the night. A cruise on the bay won’t limit your activities. Vice versa, there are many interesting sport activities await you such as Tender boat, Bamboo Basket Boat, Bamboo Row Boat, Swimming and Snorkeling, Kayaking, Trekking, Cave Discovery, Tai Chi and Yoga Practices. After joining many fun activities, tourists can spend time for leisure at the Spa on boat. Our consultant will propose you proper treatments. Let enjoy a massage at Victory Star Cruise’s spa and recover your energy for the amazing adventure on the next day. Traveling Halong Bay on Victory Star Cruise will be a great experience which gives you further knowledge about Vietnamese culture.